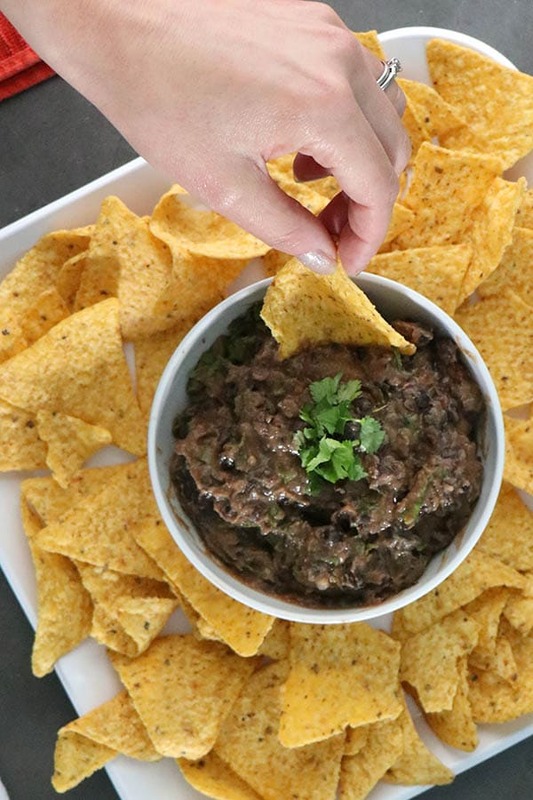 Smoky, creamy vegan black bean dip is one of my party go-tos. It only takes a few minutes to make and is perfect with chips and veggies for dipping. 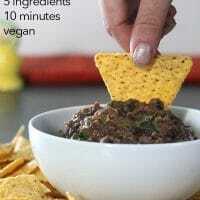 This vegan black bean dip is one of my classic recipes. I’ve been making it for around 15 years and serve it at basically every party. It’s a little bit smoky, a little bit spicy, and totally addictive. I’ve been serving this dip for so long that my friends and I named it: Becky LeBeans. Levine is my maiden name, and we are comedy geniuses. It’s also incredibly easy to make! Just mash the ingredients together in a bowl, and chill until you’re ready to dip. Bing, bang, boom. The secret to this recipe is a little can of chilis in adobo sauce. If you’ve never cracked a can of chilis in adobo before, prepare to be delighted! 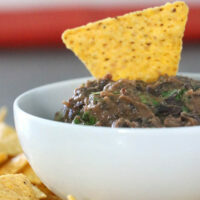 Just a touch of the sauce and even a single pepper brings a lovely smokiness to this bean dip. And if you like things hotter, feel free to add more of the chilis! 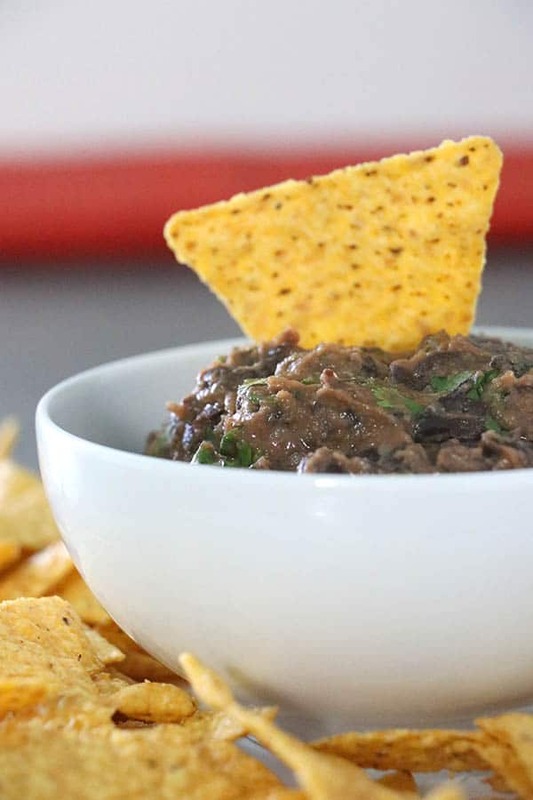 The recipe below is for a mild to medium black bean dip, because I’ve found that it has the most crowd appeal among my friends. If your friends like more heat, throw a second pepper in there! My recommendation would be to start with one, taste, and then add more, if you think it needs it. The thing to bear in mind when you’re adjusting this recipe is that it will get hotter the longer it sits. If you make it ahead, it will be a bit spicier in the morning than it was the day you made it. You may want to do one pepper the day you make it, then add more before serving to give yourself a bit more control over the heat. Like I mentioned, this makes a great dip for chips, but that’s not the only place you can use these! Try it as a sandwich spread with veggies and avocado. Use it in place of refried beans next time you make my Vegan Mexican Pizza. Stuff it into tacos with Avocado Fries for an easy dinner. Use it as a burrito filling with guacamole, rice, corn, and your favorite veggies. Spread it onto tortillas with vegan cheese, fold, and bake for some quickie vegan quesadillas. 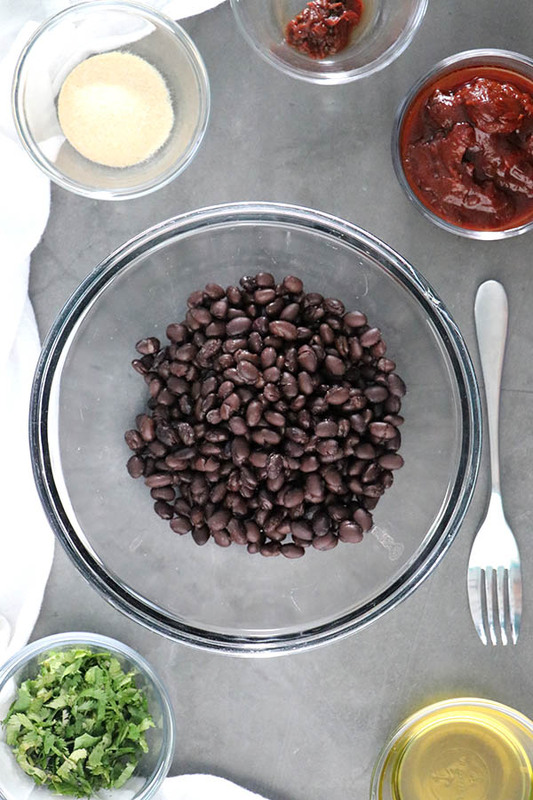 Basically, anywhere you’d use hummus or refried beans, this easy black bean dip will shine. So don’t relegate it just to chips! In a large bowl, mash the beans with a fork or potato masher. Some whole beans are fine, just make sure you get them mostly mashed up. You’ll still end up with a creamy dip. Add 2 tablespoons of adobo sauce from the can of chilis and the olive oil, and stir well. Remove 1-2 chilis from the can, and mince them. For less heat, remove the seeds. For more, leave them in. Toss in the minced chilis, cilantro, and garlic powder and stir some more, until you have a nice, creamy consistency. Add salt, to taste. If you can stand to wait, this dip is even tastier after sitting out for 15 to 20 minutes, so the flavors can meld. If not, dive in, friends! This recipe doubles easily. You can make a small batch to use as sandwich spreads or for a small gathering or double it for a bigger shindig. You can also make this in a blender, if you’re in a hurry, but blenders tend to steal a good portion of the beany goodness. Greedy blender! 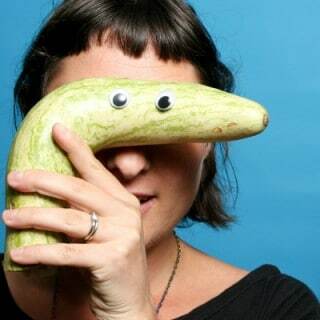 Becky LeBeans. That’s too cute. 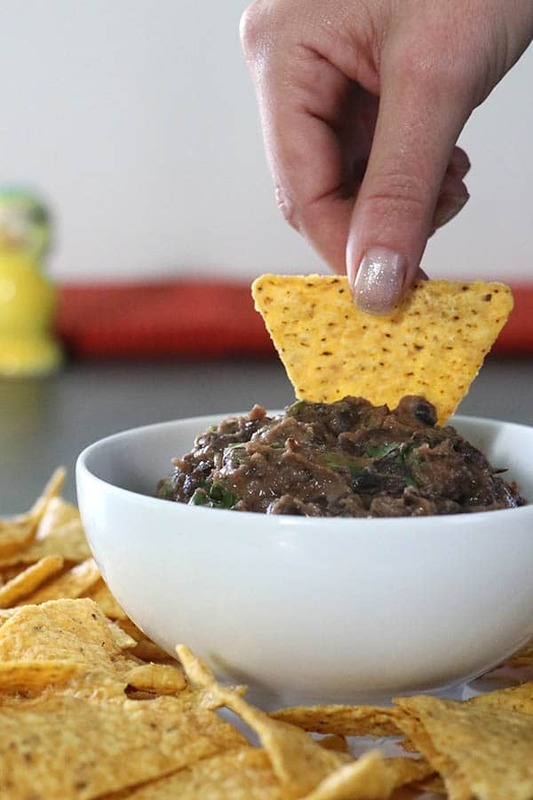 I love how easy this dip is and that the only gadget needed to make it is a fork! I love the name Becky LeBeans! And I love how easy it is to make this delicious dip!